Archaeologists are often presented mysteries or puzzles by the general public. In fact of the ~5000 known sites in the province a lot of them were found by members of the general public. There are usually two types of people who bring puzzles to archaeologists, those who know they’ve found something but they don’t know what it is and those who’ve found something and are adamant that they know what they’ve found. The former category would include the people who found two of Newfoundland’s most famous archaeological sites, Port au Choix and L’anse aux Meadows. At first those folks had no idea what they had found but it was the job of an archaeologist to figure it out. While these examples worked out to the benefit of everyone, some members of the public are led astray by their ‘discoveries’. In Newfoundland people seem often led astray by their adamant claim of having found a lost ‘Norse’ site. Such claims have been extended to areas in the Codroy Valley, White Bay, outside St. Paul’s and the Bay St. George area. These claims have been investigated by various archaeologists and have turned out to be more recent European sites. Occasionally information about a mystery does get passed on to archeologists that remain a puzzle to both the finder and archaeologists. 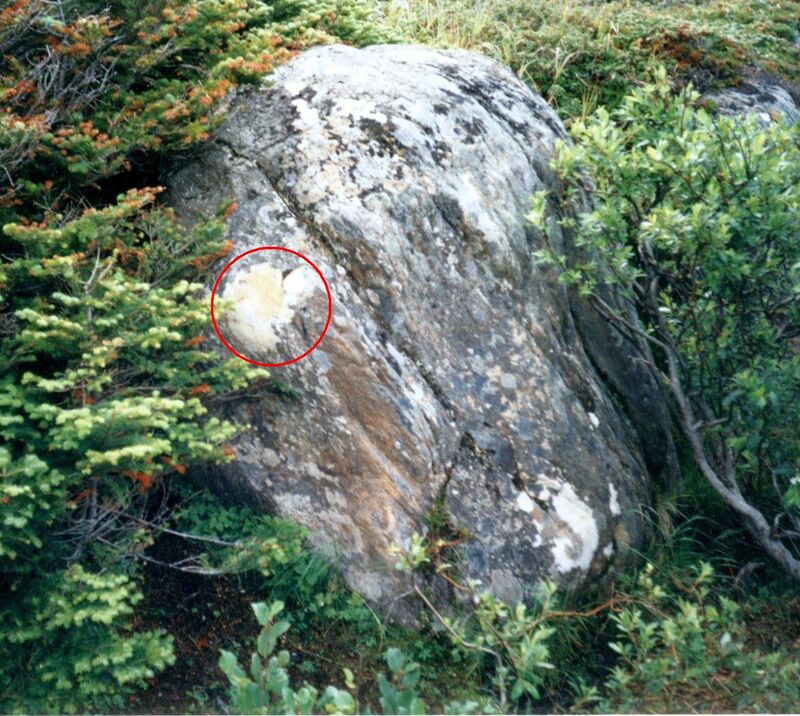 In 1999 while doing work on the northern Peninsula around the St. Lunaire-Griquet area I was told of a rock with inscriptions on it that was known to a few local people as the Irish Rock or St. Brendan’s Rock. The rock is south-east of the community of St. Lunaire. The carvings are sharp and clear and appear as a jumble of straight lines. The lines are so clear and narrow they appear to have been made by a metal tool. The rock has been known to the local folks for decades and no one has claimed to have made the lines. Local legend suggests that the inscription is likely in Ogham, an Early Medieval alphabet used primarily to write the Old Irish language and that is somehow related to St. Brendan. 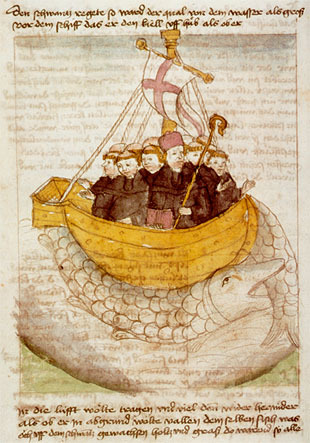 St. Brendan was supposed to have journeyed to The Isle of the Blessed as described in the ninth century Voyage of St Brendan the Navigator. Many versions exist of the story that tells of how he set out onto the Atlantic Ocean with several pilgrims searching for the Garden of Eden sometime between 512 and 530 AD. On his trip, Brendan is supposed to have seen St. Brendan’s Island, a blessed island covered with vegetation. He also encountered a sea monster. While there is no evidence the inscription is related to St. Brendan, the inscription was made by somebody. Exactly who, why or when is still unknown. In 2002 information from another member of the general public about another puzzling rock with an inscription on it resulted in a one day trip to the former community of Haystack, Long Island in Placentia Bay. We know Long Island was home to precontact Aboriginal populations and it was later used by Europeans for a home base during the cod fishery. In fact the island once had several little European communities such as Harbour Buffett and Haystack that were all linked by trails though the woods. The island would have had a population of several hundred people at one time. With the decline in the fishery and resettlement the island has become a centre for summer fishing residences and cabins. In the summer of 1970 Urve Linnamae surveyed Long Island and found 3 precontact sites on the north end of the island. The sites had Maritime Archaic Indian and Dorset Palaeoeskimo components. These sites hadn’t been seen by an archaeologist since Linnamae’s original work so along with investigating the Haystack Rock we also checked on Linnamae’s sites. Haystack Rock is on the south side of the harbour at the base of the cliff. At high tide the rock is actually underwater. Looking towards Haystack Harbour. 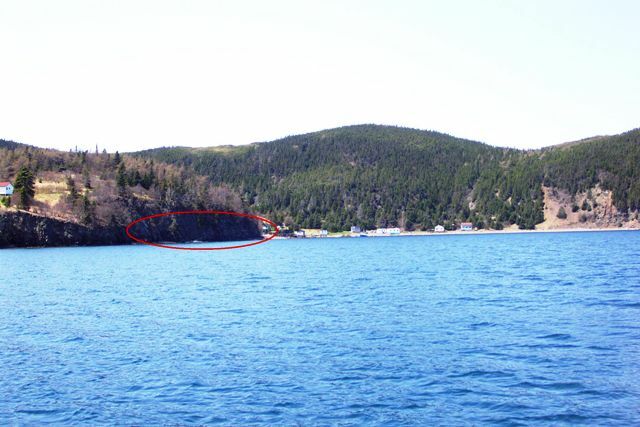 The red circle shows the rock location. Author John Robinson has dedicated a short chapter to interpreting the Haystack inscription in his book Olde Founde Lande published in 1997. Robinson writes that the inscription was known to the locals as ‘the Frenchman’s letter’. His own interpretation is that the inscription was made by someone trying to emulate the voyage of St. Brendan. His reasoning is that the voyage occurred in the mid-500s AD but the written record of his voyage was recorded around 950 AD in the Voyage of St Brendan the Navigator. Robinson suggests the L and M are the Roman numerals 50 and 1000 respectively indicating that the inscription was made in 950 AD. Like the Irish Rock, Haystack Rock has a set of clear and sharp symbols that were likely made by a metal tool. Since both sets of inscriptions appear to have been made by metal tools it is not likely they were made by precontact Aboriginal people because no precontact Aboriginal people in Newfoundland and Labrador had metal tools. Again, the inscription was made by somebody. Exactly who, why or when is still unknown. I was able to visit the Brendan Rock in Saint Lunaire several weeks ago. Has NO ONE taken this site seriously? There is more there than just a boulder! By the way I recognize the script and it is the same script (or at least the same culture) as the inscription called the Haystack Rock in Placentia Bay. I think John Robinson was very close in the description of the Haystack inscription. This script was only used on tombstones. Moving forward into ancient history! Thanks for the comment. The carving on the rock is pretty interesting and I agree it is cultural in origin. However, I also agree with the other archaeologists who have seen this rock and don’t think it warrants further investigation. 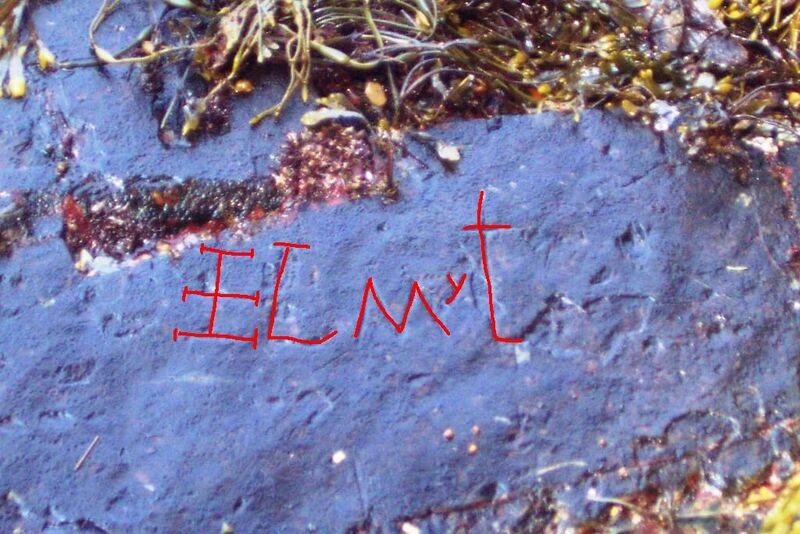 There are a number of examples of similarly carved letters, initials, names, pictographs in rock across the Island which have been documented by archaeologists, and that none of these have been proven to be earlier than the inhabitants of the communities in which they are found. The best documented 18th-19thC graffiti can be found on fallen slabs of soapstone in the Town of Fleur de Lys. I have found a number of interesting rocks along Canada’s east coast with carvings that don’t don’t fit any given current history. I believe most of these rock carvings were made by Vikings and either indicate grave sites/ tombstone inscriptions or were markers of some kind. I still haven’t been to northern part of ‘the Rock’ but would like to take a trip. Please email me as I’d like to find out more about the carvings you’ve found/seen. It looks pretty medieval to me. I teach Latin but I’m not an epigraphist. I think it is saying “Helmut” this being a Germanic name. The “H” and “E” are combined into a cool Christian cross looking single letter. I think this is intentional. It’s a kind of signature for the guy. The “y” is how they represented the u with umlaut sound in Old English. This inscription could maybe be Christian Norse or Anglo Saxon; why not Christian Icelandic from the 13th Century or thereabouts? I wonder. Yes, the script appears similar to Latin. Where do you teach Latin? Your suggestions of Christian Norse or Anglo Saxon are possible interpretations. There is a Norse site in northern Newfoundland but there is no evidence of Anglo Saxon on the Island. I teach Latin in Ontario. I’ve got a few WordPress pages up. One of mine is a reassessment of how the English language came to dominate in Britain in the early Middle Ages. That Latin inscription is very bold and quite distinct. I think Burcher said it is dated to around 500 AD by an epigraphist. The “y” looks very Anglo-Saxon, but I don’t known Icelandic, and they may have used the same letter. “Helmut” is a pretty Germanic sounding name. I don’t expect it’s “Celtic” as in Irish or Welsh or whatever. They will likely now look for a Phoenician village. Since they know where the copper veins are, they will probably look around those for evidence of settlement. There has to be something left behind. If they took the time to inscribe rocks, then there must be something to dig up. 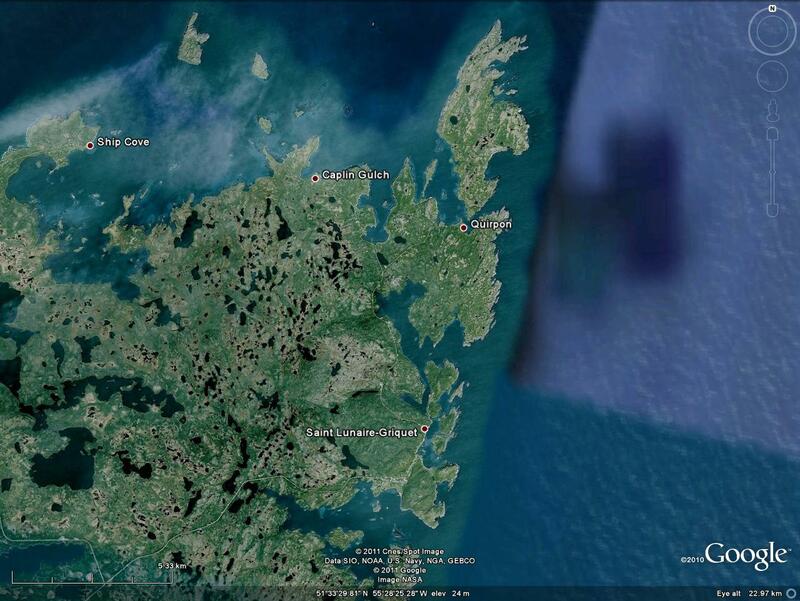 Newfoundland isn’t enormous… I wouldn’t be surprised if they find some stuff relatively soon… Very exciting stuff. I am looking forward to teaching Canadian history differently, and Classics too: Canada (well some parts of it) was part of the Carthaginian Empire apparently: makes the Hannibal versus Rome thing more interesting for us. I tend to err on the side of the simplest explanation is the most likely. I can’t see this inscription being from 500ad or Phoenician. There is no physical evidence for people from 500ad or Phoenicians ever being in the Province. I can see this as being something left behind by a military ships captain or crew member with some education. For example, we know Captain Cook was on the south coast of the Island in the 1700s mapping the island for the English government. I could even stretch and see this as possibly L’anse aux Meadows Norse or a later Norse group. Archaeology has been ongoing in Newfoundland since the early 1900s, and it has been intensively ongoing since the 1960s. There are ~4000 recorded archaeology sites in the Province. Most of those sites were brought to our attention by members of the general public finding archaeological material. Surely if someone had found material relating to 500ad or Phoenicians we would have seen it by now. You _are_ seeing it now. There are more articles out there to read about Burcher’s work besides this one. No 19th Century ship’s captain could write in Tartessian of course! Hahaha! I think the simplest explanation for a Tartessian inscription is that it is a Tartessian inscription. He says he has found a Phoenician inscription, which the ROM translated as “property of the king of Phoenicia.” Watching out for fakes is a major part of what these experts are experts for. If he has the ROM, Oxford, and the University of Wales on his side, I think he is legit… He has the goods. The more goods he can find the better an understanding we can have. Remember that Darwin was mocked in his day. One reason why any remains have been lost to archaeology, is that no one expects them to be Phoenician or Roman or Tartessian, and when found, assumes they are lost from some kind of antiquities collection that someone brought over from the Old World. There are a few odd Old World antiquities found here and there in Native burial sites. One I remember from a decade ago is some kind of small Roman-era idol buried in an Aztec tomb. The only safe conclusion is that it was brought over by Spanish colonists and somehow got mixed in… Maybe/probably, but who knows? No one believed the Vikings made it over until they excavated L’Anse aux Meadows. Obviously, finding more than a few inscriptions is going to make us feel a bit more secure in believing the hypothesis. More needs to be found – I expect it will be found now that they are actually looking for it. We’ll see what happens – exciting times! Was there any “Helmut” who traveled with Lief to Vinland in the sagas? “One swallow does not make summer” to quote Chaucer, but dismissing these things out of hand might be doing a travesty to our history, like as what Schliemann did to the parts of Troy he thought didn’t fit with what he expected was the right time period. The evidence of the so-called “Brendan Rock” in Saint Lunaire is far from clear as to it’s origin and meaning. 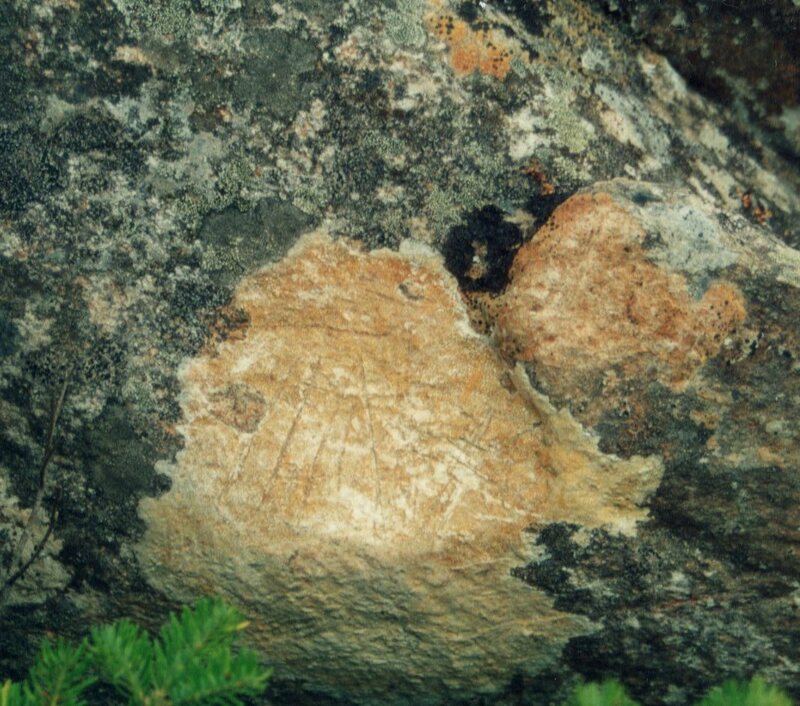 One might equally argue, with references to unnamed “experts” such as myself, that this is a Beothuk pictograph, carved sometime after contact (with a metal implement) such as a scavenged nail from a burned European stage. In fact, without any evidence to support my argument, one might even interpret the drawing as a lone mamateek (the last of the Beothuk encampments) situated among the Birchy woods of Newfoundland’s interior. The story deepens when you consider the meaning of the cross which is engraved over the Beothuk structure. The holy symbol of the Christian religion is of course evidence of the silent barter known to have occurred between the Beothuk and Europeans. And last, but not least, the most ominous element of this carving: the rounded cloud above the forest which can be interpreted (as any child would recognize) as the doom of the Beothuk culture presented by the impact of the newcomers into this land. Anyone can make wild claims, particularly when evidence is cherry picked to support one’s argument, or when appeals are made to unnamed authority – but the proof is in the evidence (for which I see very little in the claims of ancient European visitation). So, what are these “carvings”? perhaps the simplest answer requires a second thought – graffiti carved by bored folks hanging out by a rock for a smoke. As european archaeologist, if I would found this inscription in Europe, I would date it as Modern. The L and the T don’t seem medieval at all. And never seem tartesian, iberian or any other ancient alphabet. Thank-you for the comment. Which inscription are you referring to, Haystack or St. Lunaire-Griquet? I doubt their authenticity now too. I haven’t heard anything more about them since last year, and speaking to an archaeologist from France, I learned that they could even be due to ballast brought in hulls from Europe and deposited in Newfoundland – a common stopping off point. I think the reason for these kind of “Celtic” and whatever theories is threefold: 1. The Vikings did it so “why not others?” and 2. We “Celtic/European” descended people want to feel we belong in this land and 3. We want our country (Canada, USA, whatever) to have an ancient history, since ancient history is cool – swords, ships, mighty empires and all. Okay, But, all that stuff is already readily available with verifiably true archaeology, oral literatures, linguistics, histories, sites, and so forth. I’m learning Mohawk and Ojibwe, and my thirst for this stuff is being satisfied even more and better than I ever imagined it would be! The Mohawks have orally transmitted literature – creation legends, histories, constitutions etc, as do the Ojibwes, and the languages and cultures are just fascinating. They make me more enthusiastic to be living in Canada. Very cool stuff! Knowing Latin and Ancient Greek (and of course English and French) just makes the intellectual adventure that much better – okay I’m a history and languages nerd, sorry about that! If any Phoenicians or whatever came, they apparently didn’t do anything of any importance that left any major traces – still worth keeping an eye open for though – no one believed the Viking stuff before L’Anse Aux Meadows was found. Probably they didn’t come though, and even if they had, the Beothuks would have beat them out anyways, more than likely. The Haystack Rock has a legitimate inscription, clearly carved into bedrock and therefore is not ballast brought in hulls from Europe. Ballast stone (usually flint) is regularly recognized in European archaeology sites in Newfoundland and Labrador. In my opinion, the St. Lunaire ‘inscription’ is little more than the result of someone scratching a rock. I do not think it is decipherable text. Like the Haystack rock, it is part of the bedrock and therefore is not ballast brought in hulls from Europe. I subscribe to the Occam’s Razor school of thought, therefore I do not believe either of these were inscribed or scratched by Irish monks, or Phoenician or Tartessian sailors. But, in archaeology who knows…you can’t close your mind to the possibility but you can’t spend considerable time looking for Phoenician sites in Newfoundland either. I agree with your 3 reasons for theories, but I would add a fourth, the discoverer of a site produced by someone out of the ordinary (such as Irish monks, or Phoenician or Tartessian sailors) would become famous. I agree, the aboriginal cultures in Canada are a lot more complex and have a more rich history that most Canadians understand or want to understand. Good point about fame being a motivator. With Europeans milling about in Newfoundland now for over 500(!) years without much in the way of a break, the chances of someone carving something like that are not very low. 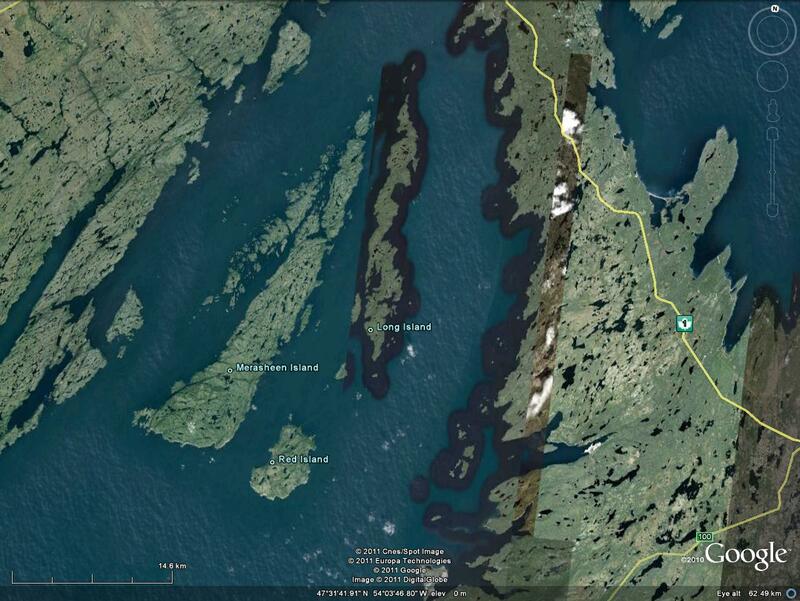 However, with the L’Anse site and more recent discoveries in Baffin Island and (? )Labrador too(?) of Viking remains, indeed, who knows… maybe it’s a Christian Viking thing, or even Irish, since the Irish were involved a bit in Iceland. I was at the Six Nations Language Conference a few weekends ago for three days, and I was blown away by how much history, language and culture they have, and have preserved. They really struck me as one of the “great ancient civilizations” like the Maya or Phoenicians or whatever. It just seems so wrong that their heritage just doesn’t make it into our national consciousness. The legacy is definitely here amongst us (corn, tobacco, pipes, lacrosse, canoes, snowshoes, arguably “confederation”, aspects of women’s rights [they had a very persuasive presentation on this – with a French philosopher visiting the Iroquois in the 18th Century and coming back to Europe with ideas about more “natural cultures” having women and men equal] and so on) but the literature like the creation tales, the histories and such are not accessed by the general public nor apparently our Canadian history writers. Our foundation legends about Cartier, Champlain, Brock, and MacDonald, are all very good, but why the Native folks’ epics get written out of our history and national identity defies logic altogether, and it isn’t like the stuff was hidden – George Copway, Pauline Johnson, Basil Johnston and such wrote popular books about this very stuff. Quite bizarre. Viking culture is cool and all, of course, but so is Iroquoian, and Algonquin (etc) and these latter two have been far more important in Canada than the Vikings, yet you’d hardly know it reading any Canadian history book – the Vikings get more press than both, and you could likely not even know who these two groups are after reading such books! I agree with what you wrote about the Aboriginal cultures. There is a lot of history there and they have had a huge role in the shaping of Canada, as they should, but Canadians do not recognize them for that role. I don’t like it, but I think it comes down to the old saying, history is written by the winners. Have you seen what the Canadian Government is doing to the Canadian Museum of Civilization? Soon to be the Canadian History Museum, or the White Christian Guys Museum? But, hopefully with people like you who are interested in Aboriginal culture and history and things like this blog some people may learn, understand, respect and realize the role and history of Aboriginal cultures. Nice response, I suspect some of it may have gone over the head and some of it may have surprised the original article writer. Sounds as though you are doing your part to make a difference.